The 32-year old Portrush star will tee it up with the Australian in the final group knowing he has to have the self-belief that helped Ballesteros grab two of his three Open wins to keep the Claret Jug in Northern Ireland. 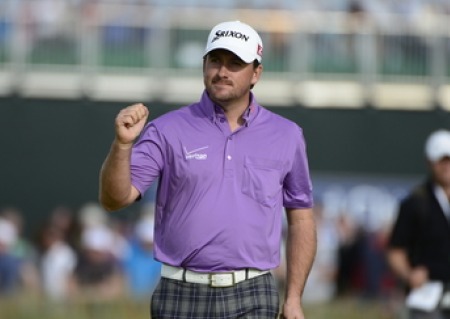 “I watched this documentary about Seve, who has always been one of my great heroes, and it was truly inspirational stuff,” said McDowell, who is tied for second with American Brandt Snedeker, who birdied the last for a 73. “Everyone remembers how he famously made birdie from the temporary car park on 16 when he won his first Open, but there was so much more to love about what he did here. “I was particularly impressed by a scene when someone pointed out that Lytham is notorious for its pot bunkers, and they had to be avoided at all costs. “Seve just pumped out his chest and said something like: ‘Don’t even mention such things to me – don’t you know that I am the finest bunker player in all the world’. Adam Scott will be bidding for his first major on Sunday. Picture Fran Caffrey www.golffile.ieMcDowell started the day six shots behind Snedeker on four under but by the time he got to the turn he was seven adrift of Scott. He had to hole a six footer to avoid a three-putt bogey at the first, then bogeyed the second after bounding through the back of the green. But he was soon back on track, draining a 20 footer for birdie at the fourth to get back to level for the day before handing it back at the next. He didn’t panic, however, and holed an eight footer at the eighth to get back to level for the day. With Scott racing ahead at the top of the leaderboard, McDowell aggressively charged birdie putts past the hole at the 11th and 12th. But he soon hit the birdie trail, holing a 15 footer at the 13th before canning one from 30 feet at the 14th to get to within six of Scott on six under. 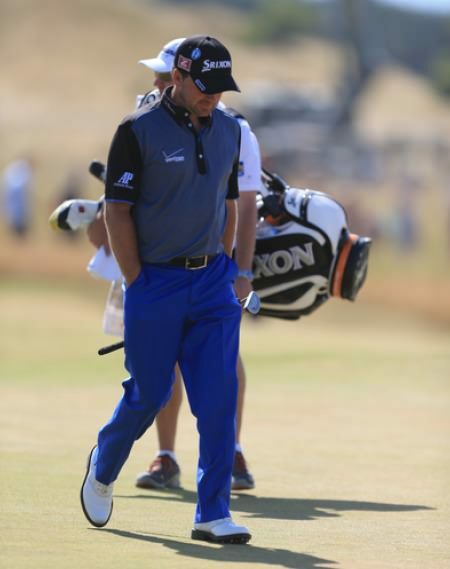 The Australian was hugely impressive, following six straight pars with birdies at the seventh and eighth and then followed a 25 foot par save at the 10th with a brilliant two-putt birdie at the par-five 11th. 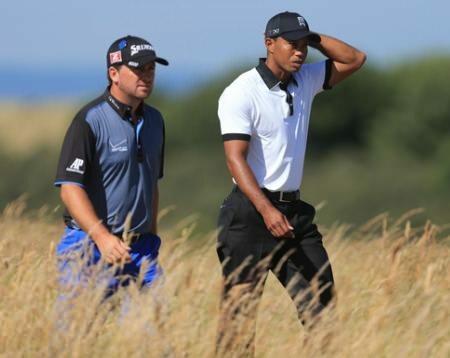 As Snedeker imploded, Tiger Woods was soon lurking just four off the pace on seven under with McDowell tied for third with the overnight leader and the Dane Thorbjorn Olesen on six under. Tiger Woods plays his approach to the 18th in the third round. Photo Eoin Clarke/www.golffile.ieMcDowell hit two hybrids on the 15th, finding the centre of the green and then two-putting for par to remain on six under. But he produced some superb golf down the last three holes to clinch his place in the final group today. At the driveable 16th he laid up off the tee and fired a 148-yard approach to 15 feet but left his birdie putt inches short in the jaws of the hole. Then at the 17th he found the fairway again but this time his 188-yard six iron finished just 12 feet from the hole and the made no mistake, draining the putt to move into solo second on seven under. The Rathmore man described the tee shot on the 18th as a jigsaw puzzle earlier in the week but he solved it with a perfect drive and hit a 175-yard seven iron to 18 feet. His left to right swinging birdie putt came up short and low but a 67 was enough to seal his place in the last group as Scott hit a 68 to lead on 11 under. The Australian knows that he will be tough to beat if he continues to play the way he has s far this week but he also knows that his lead can disappear in an instant with winds gusting up to 35 mph forecast for Sunday afternoon. Woods managed a 70 that left him alone in fourth on six under with Ernie Els (68) and Zach Johnson (66) tied for fifth on five under. 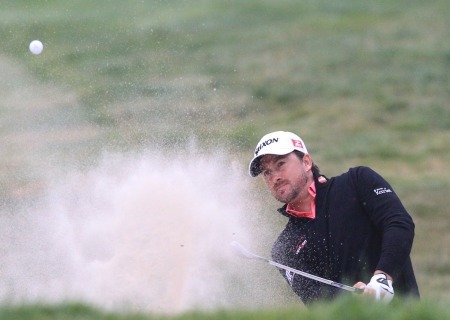 Graeme McDowell knows that he’s going to be in a few bunkers this week. 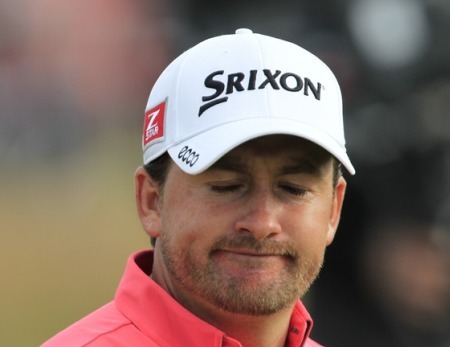 Photo Eoin Clarke/www.golffile.ie Graeme McDowell insists he must psyche himself up like Spanish warrior Seve Ballesteros to bring the Claret Jug back to Portrush.